Candy canes are pretty irresistible, so this has been the perfect counting busy bag. It was a cinch to make, and all of my kiddos absolutely love it. 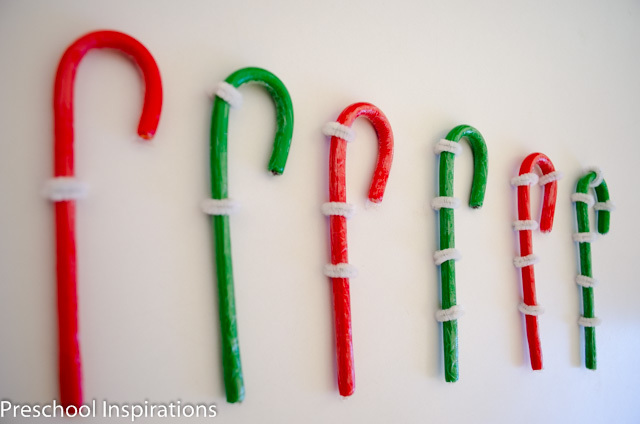 I found solid colored candy canes at the grocery store then curled pipe cleaners/chenille stems around them and trimmed them. The edges were a bit sharp so I pushed them down as well as possible. So far no one has complained about them, so that’s always a good thing. Now we have DIY candy cane stripes, which each child can put on and count. 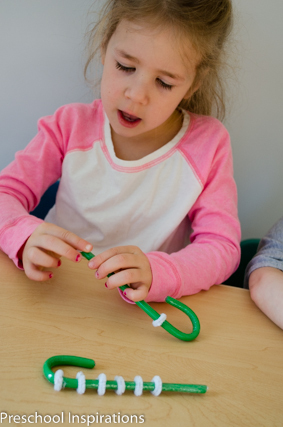 It’s both a math activity and great fine motor practice. With younger children I like to focus on counting and helping them feel successful about that. Once they’re ready for more of a challenge you can throw in some number cards. Here’s what the setup looked like with the older ones, Montessori inspired. Playing with candy canes is a blast, but just know that some will probably break. It’s a great way to help encourage children to treat items gently and learn about things that are fragile. Of course you can always eat the broken candy canes or use them in a science experiment. 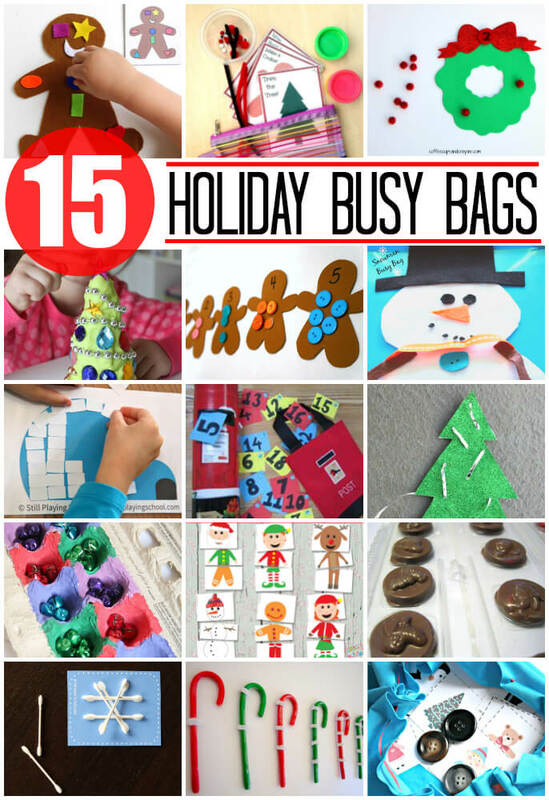 To see more fun-filled Christmas themed busy bags, pop on over to one of my favorite kid bloggers below. 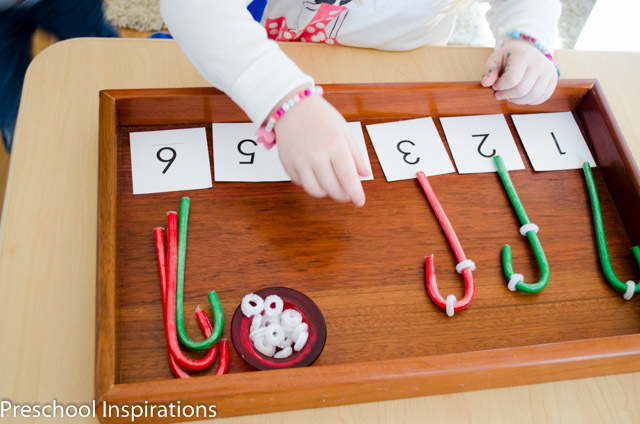 A great way to combine counting and fine motor skills development. Such a colourful activity too. Thank you so much, Emma! It’s been such a fun activity :). This is a great center that my preschool students will LOVE. It’s perfect for my class because it will be challenging for the younger ones and the more mature ones. Can’t wait to do this with them right after Thanksgiving break. Thanks!!! I hope they can’t get enough of it, Katie! Thanks for the comment :). Lovely way to combine Christmas fun and learning! Thank you so much, Mihaela! It is a ton of fun!